Once you have created your new Yahoo Mail account, it does not have any contacts; in this tutorial, we will show you how to add a contact from a Yahoo email, and how to create contacts from scratch in your Yahoo Mail account. Any one who sends you an email can become a new contact with a single click, while creating a new contact by hand requires you to enter all the new contact's information yourself. We will start by showing you how to add an email sender to your contact list, (what email programs call address book). You will also learn how to make Yahoo Mail automatically save email recipients as contacts. Once the sender's email has loaded in the Reading Pane, notice that next to the email sender's name and email address is a link that reads "Add to Contacts". Click on it, and Yahoo Mail will open the Add Contact popup, pre-populated with the email sender's first and last name (if supplied), and his or her email address. To save just this information for the new contact, simply click Save, and you are done! But Yahoo Mail also lets you enter the contact's Chat ID (for either Yahoo's own IM client or the Windows Live Hotmail Messenger), as well as a phone number. In a later tutorial, we will show you how to edit your contact's information, and add many more pieces of information on the contact's profile. When you do not have an email to add a new contact, you can create contacts from scratch just as easily - the only difference is that the typing will be on you! To create a new contact, click on the Add link displayed next to Contacts, right below the standard Yahoo Mail email folders. 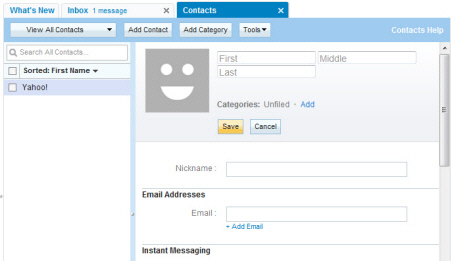 As implied by the position of the Save button, all you need to create a contact is just the person's name; in most cases however, if you go through the trouble of creating a new contact from scratch, you will probably want to enter more information, especially an email address you can use from Yahoo Mail to get in touch with the contact. Yahoo Mail contacts tip: any contact can have more than one email address associated with him/her, and the same applies for most other fields: notice (for example) below the Email next field, a "+ Add Email" link. This link adds a new text field for additional email addresses. Another way to keep your contacts up-to-date is to use an option, disabled by default, which Yahoo Mail offers, which will automatically add as contact any person to whom you send an email; the reason this option is turned off by default is that you may not always want to add everyone you email in your Yahoo address book. Nonetheless, let us show you how to enable or disable the automatic saving of email recipients as contacts.